Have you seen the new Neft FireVison sports products? They are so cool! With NERF FireVision Sports, the magic happens when you put the FireVision Frames on. To turn up the heat on throws and catches, slip on your futuristically cool NERF FireVision Frames and start tossing around your FireVision Football — you'll see the game in a whole new light. Literally! Thanks to innovative new FireVision Microprism Technology, you and anyone wearing a pair of FireVision Frames will see an illuminated football in the daytime and in dim or low lighting. BzzAgent sent our family a football set to try and the kids have had a great time with it. 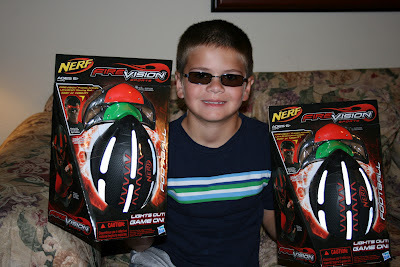 The football comes with two pair of glasses﻿- red and green. I had P and WC put them on so you could see what they look like. Now, when I took this photo, it was too bright out for the effect to really work, but I wanted you to see the lights on the glasses. When it gets a bit darker in the evenings, the ball literally glows when you have a pair of these glasses on. People without the glasse on don't see the effect. P loved his set so much that we've purchased three sets to give as birthday gifts this month! Definitely a hit with my 9 year old! ﻿Disclosure: BzzAgent provided the FireVision Football set for word-of-mouth marketing purposes. The Amazon link above is a referral link. These were WAY cool ... my kiddos loved when I received this game in the mail via BzzAgent. Spencer is in LOVE with this gift. Thanks so much!